1. Heat the oil and butter in a medium saucepan. Cook the shallots and celery for 3-4 minutes until beginning to soften. Add the garlic and cook for 1 minute more. 2. Add the celeriac, potato, bay leaf and thyme and cook for 1 minute. Pour over the stock, cover and simmer for 20 minutes until the vegetables are very tender. 3. Remove the pan from the heat and take out the bay leaf. Add about three quarters of the hazelnuts, then chop the remaining nuts and set aside. 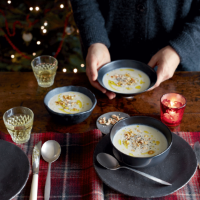 Blend the soup with a stick blender until smooth, stir in the crème fraîche and blend again. 4. Add a squeeze of lemon then ladle into bowls. Serve scattered with the reserved hazelnuts and drizzled with the truffle oil. Cook's tipTo toast hazelnuts, preheat the oven to 180°C, gas mark 4. Spread the nuts over a baking tray and place in the oven for about 5 minutes until golden.